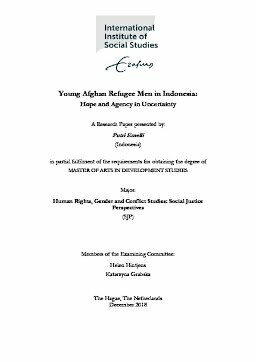 The study looks at how young Afghan refugees in Indonesia conceptualise their present and their future in relation to their sense of hope in a state of protracted uncertainty. How far does their sense of hope relate to their sense of agency? How does this translate into their self-representations on social media? The study aims to answer these central questions in order to argue for the importance of understanding hope as a survival strategy through the young men’s engagement in everyday storytelling and sensemaking – both offline and online. It is a qualitative study in Jakarta, which involved interviews, focus groups, and observations of eleven young Afghan respondents, aged from 16 to 22. Elements of digital storytelling and visual ethnographic analysis are used to interpret social media posts and how stories in the personal realm migrate into the digital and public realm. Social media was a way to gain more insight into the ranged nuances of their self-representations, which went beyond the passive label of ‘refugee’. The researcher is a journalist by background and met these young Afghan men in 2015, which helped to build trust with a particularly marginal community, and facilitated the research on this sensitive topic. The main finding of the study was that despite their feelings of despair, and being side lined by bureaucratic process and mainstream debates about refugees in Indonesia, these young Afghan youths showed considerable persistence in making their daily lives tolerable and in imbuing their situations of uncertainty with meaning. This assigning of meaning is an exercise of sensemaking that the respondents practice through stories, digital or otherwise. A particular finding was that few wished to integrate into Indonesia, and most dreamed of a seemingly unattainable resettlement elsewhere. In addition, they blamed the UNHCR for many of their problems, an interesting finding. Overall, the re-search concludes that for young Afghan men, the use of storytelling to express their hopes and aspirations are a vital tool to retain a sense of agency, and to feel some control over their own lives.